In the fall of 2017, my mother and favorite birding buddy visited the mountains of Montana for a fishing trip. While hiking along a river, she spotted a large, gray and black bird on the branch of a tree. Upon returning, she raved about her new favorite species: the Clark’s Nutcracker. I’ve been dying to see one ever since. I finally had my chance in June, on a two day trip to Rocky Mountain National Park. My husband and I had limited time to see the massive park, and, like my parents in Montana, a good portion of that would be devoted to fly-fishing. Would I have enough time to seek out this unique bird? The first afternoon we spent at the park we remained at lower altitudes, and though I spotted beautiful swallows and sparrows, the nutcracker remained elusive. Day two began with a morning drive across the Trail Ridge Road to reach the other side of the Continental Divide, a route that would climb over 12,000 feet – more than high enough to make the nutcracker a possibility. As we steadily drove up and up and up and up, I read fun facts to my husband. We stopped at the overlook parking areas, staring out across blue mountains and plunging green valleys. At Rainbow Curve, we exchanged the DSLR camera to take some photos of each other with the breathtaking vista behind. 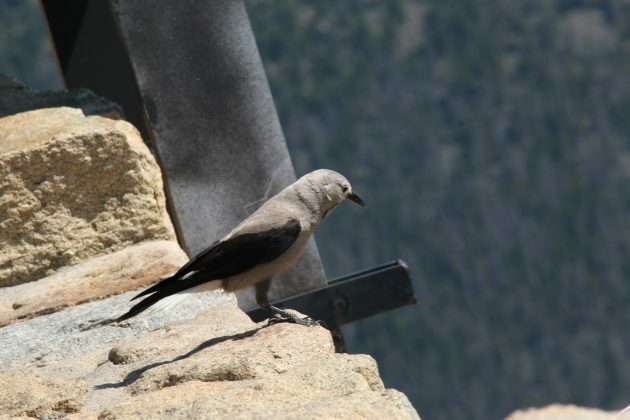 At that moment, a large, gray silhouette alighted from a pine behind us and perched confidently on the rocks right below the overlook’s walls. 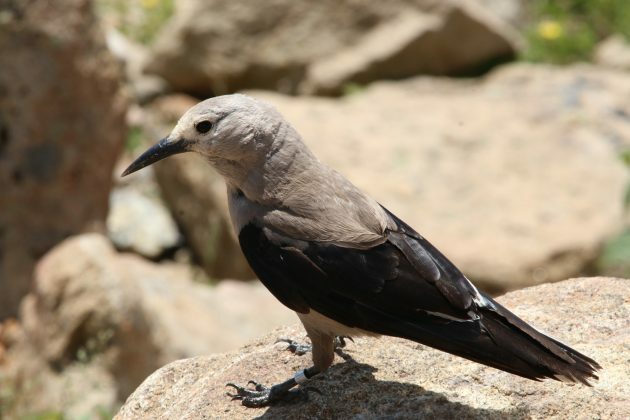 A Clark’s Nutcracker! They really are beautiful birds. With crisp colors and a curious demeanor (signs all over the place warn people not to feed then), they are fun birds to watch. In all, three nutcrackers bounced across the stones, coming close enough for excellent photos. I became so excited I accidentally swore in front of some young kids also enjoying views of the bird. Oops. My husband liked the nutcracker, but only one person matched my enthusiasm for this life bird: my mom!